Three-Stone Pear-Shaped Diamond Engagement Ring | Shane Co.
Two stunning pear-shaped diamonds, at approximately .21 carat total weight, have been hand-matched for exceptional beauty and sparkle in this 3mm wide ring. 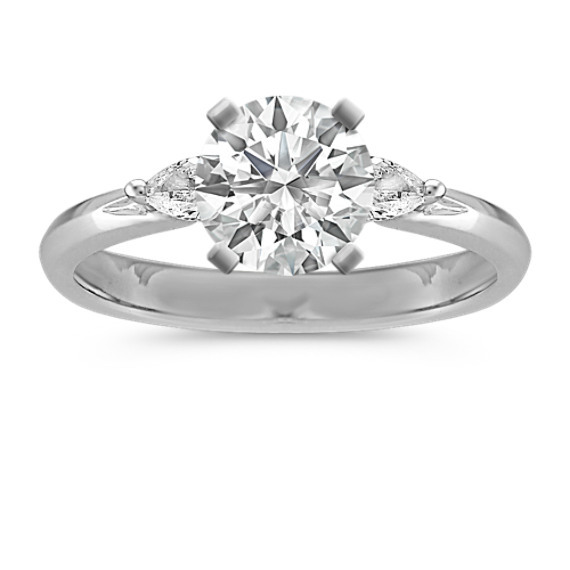 The stones are set in quality 14 karat white gold and make the perfect accents to the center diamond of your choice. Love the custom ring I ordered! Surprised my girlfriend, now fiancé with a beautiful ring from Shane co. Couldnt be happier with the ring and diamond. Had to get it resized and it was no problem. Super friendly staff and a very easy website to use as well. I will be going back to Shane Co. for my ring as well. Beautiful but hard to find a matching band.